A Japan/America co-production, SD Gundam Force initially broadcasted on Cartoon Network in US for 26 episodes, and later on TV Tokyo for 52 episodes, making it the longest Gundam series to date. Currently there has been no official word on the fate of the show within the US other than odd mentions, though fans continue to campaign for the release of the final 26 episodes on DVD. 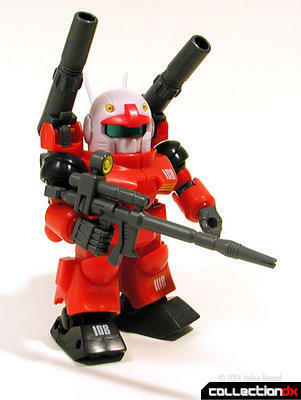 Unlike previous SD Gundam series, SD stands for Superior Defender. It is a crossover series based on the three SD settings that were used in earlier SD Gundam anime and manga: SD Commando, a science-fiction-styled militaristic setting; SD Sengokuden, a setting with samurai-themed robots; SD Gundam Gaiden, a medieval European fantasy-themed setting. It also contains many references and homages to the standard Gundam shows, especially those of the Universal Century, Future Century, and After Colony timelines.